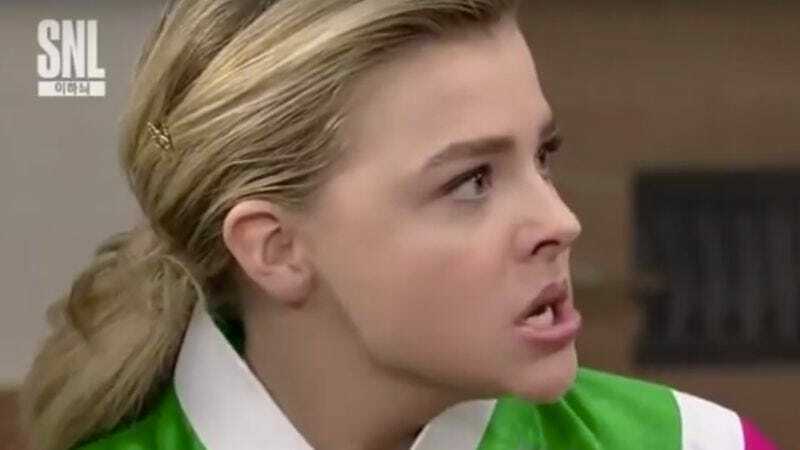 According to PopCrush, while in South Korea promoting the first-person shooter multiplayer PC game Sudden Attack, Chloë Grace Moretz made history: She became the first American to have a guest appearance on Korea’s version of Saturday Night Live. Moretz performed in a Korean-language sketch with comedian Yoo Se-yoon, and it’s pretty fantastic. The sketch actually plays on the strangeness of Moretz’s presence on the show, as she plays a local boy’s American girlfriend who seems to have prepared to meet the parents by studying too many K-dramas. Instead of having a strong grasp on actual cultural customs—or what people wear, for that matter—she keeps overreacting to everything said, acting like a Korean soap opera character. Her reactions grow increasingly over-the-top until she’s literally slapping her boyfriend with kimchi. According to AllKPop, that bit is a play on a famous scene from Everybody, Kimchi!, a Korean comedy-drama series from 2014 about a woman who starts her own kimchi business. You don’t have to know Korean to figure out the straightforward sketch premise, especially since a lot of it relies on Moretz’s physical performance (she speaks Korean, too). Slapping someone with kimchi is funny in any language. Moretz keeps busy, whether she’s showing up on international versions of SNL, showing off her video game skills as a brand ambassador, or fighting aliens during the end of the world. She’s also set to grow a tail in Universal’s upcoming live-action Little Mermaid movie and will next be seen getting Kaylie Hooper levels of wild in Neighbors 2: Sorority Rising.